The Miller Multimatic 200 is a multi-purpose machine with a pretty decent power range. 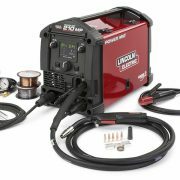 For MIG Welding the rated output is 150 Amps at 21.5 Volts with a 20 percent duty cycle. For TIG Welding the rated output is 150 Amps at 16 Volts with a 30 percent duty cycle. When using the STICK settings, the machines rated output is 150 Amps at 26 Volts with a 30 percent duty cycle. The automatic settings on the machine are near perfect. You can lay down an impressive bead of weld on steel from 14 gauge up to 3/16” thick plate with no trouble at all. One feature that the Miller Multimatic 200 has that you may not find in their competitors’ machines is a gas solenoid that is utilized in the TIG process. This is pretty slick for a portable welder. This is a high-end machine that features Miller’s MVP auto-set Elite controls so you can count on superior arc characteristics even when welding with CO2 gas. The package contains just about everything you need including a heavy-duty 10 FT Bernard Q150 MIG Gun, a 10-foot STICK Stinger, a heavy-duty 10-foot work cable and rugged clamp. The Smith brand regulator and flow-gauge includes a 12-foot gas hose. Throw in a material thickness gauge and you’re ready to start welding like a pro. Output Power: MIG 150 Amps at 21.5 Volts, STICK 150 Amps at 26 Volts, & TIG 150 Amps at 16 Volts. I can’t really find anything wrong with the machine itself so all I can say is that it’s not a perfect fit for the novice welder. If you don’t have time to learn and practice TIG welding, and if you don’t have a need, then opt for a MIG only machine. If you plan to do a lot of welding this is my top pick. You can weld just about anything imaginable with the Miller Multimatic 200. It will take a bit of practice and some skill but before you know it you will be MIG Welding, TIG Welding and STICK Welding; all with the same machine. And weighing in at just 46 LBs it still qualifies as a portable machine. Sweet!